Green buildings ideally exist within the systems of a city that support greening across all scales. 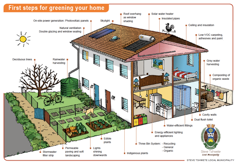 The guidelines include the greening of buildings (houses, offices, retail, and public buildings) and precincts. These are then further detailed through discussing how to green regarding each phase of development of the building: design, construction and management. The categories included Management and Governance, Spatial Planning and Land Use Management, Transport Planning, Energy, Water, Waste, Internal Environmental Quality, Pollution, Biodiversity, Building Materials and Green Procurement, and Urban Agriculture. A priority was to work with the municipalities to make this practical to reduce greenhouse gas emissions and resource consumption along with engaging in innovative strategies to promote the green economy.